A four-point line? The question has been brought up recently with Warriors coach Steve Kerr the latest to weigh in on the radical NBA idea. OKLAHOMA CITY — Despite being one of the most proficient shooters in NBA history, leading the most prolific outside shooting team of all time, and coaching the best deep shot-maker in the game, Warriors coach Steve Kerr wants nothing to do with the concept of a four-point line. Kerr, who twice led the league in three-point percentage and won the 1997 Three-Point Contest, flatly rejected the possible innovation at Warriors practice on Saturday, one day before Game 3 of the Western Conference finals versus the Thunder. The topic reappeared in headlines this week thanks to a New Yorker story quoting Hall of Fame sharpshooters Larry Bird and Reggie Miller. While Miller dismissed the idea as “comical” and pointed out that Warriors guard Stephen Curry was the only player who regularly hits shots from beyond 30 feet, Bird was more open to the idea, noting that basketball “evolves” and that young players could drill themselves into becoming quality shooters from four-point range. The debate first gained traction in 2014 when ESPN.com reported that NBA executives had discussed the possibility of adding a four-point line and expanding the size of the court. At the time, a league spokesman downplayed the hypothetical discussions, saying they weren’t “serious.” Currently, the NBA three-point line is 23' 9" at the top and 22' in the corners, distances that haven’t changed since the 1997–98 season. Kerr, whose career 45.4% shooting from deep remains the NBA’s best among qualified shooters, joined Miller in rejecting the notion out of hand. Ironically, there’s no question that Kerr’s Warriors would be the biggest beneficiaries of a four-point line. This year, Golden State set an NBA record by making 1,077 three-pointers as a team, while Curry set individual records for three-pointers (402) and three-point attempts (886). 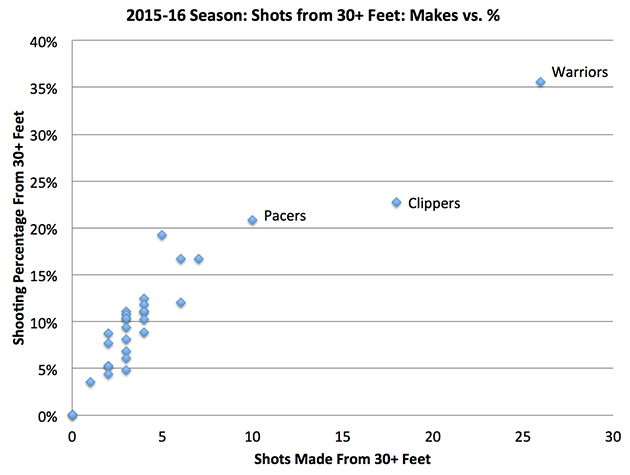 Along the way, Golden State led the league in makes and efficiency on shots taken from 30-plus feet. The Warriors hit 26 for 73 (35.6%) from ultra-deep, via NBA.com. Most of that long-distance marksmanship came via Curry, who repeatedly made headlines for draining shots from the center court logo this season. According to data from NBA.com, Curry shot a ridiculous 21 for 45 (46.7%) on shots from 30-plus feet, including a memorable 37-foot bomb from just inside half-court to beat the Thunder in overtime on Feb. 27. 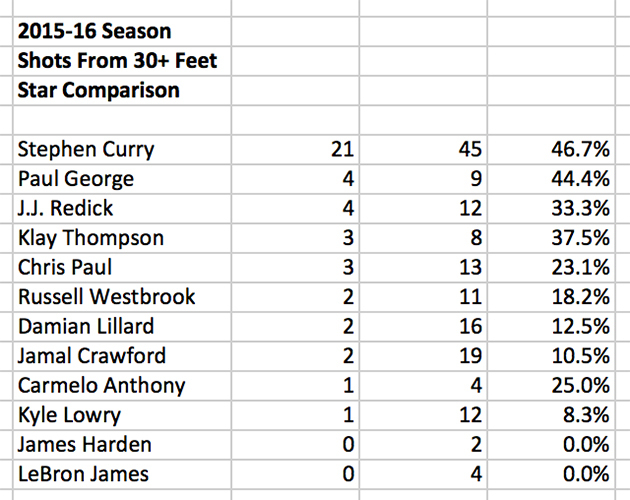 The following chart shows Curry’s shooting from 30-plus feet compared to other All-Stars and players who attempted a meaningful volume of shots from that distance this season. Clearly, Curry is in his own ballpark, even compared to other top performers like Paul George (4 for 9), J.J. Redick (4 for 12), Chris Paul (3 for 13) and Warriors teammate Klay Thompson (3 for 8). Although Kerr made his personal philosophical preference on the four-point line clear, he was quick to acknowledge that he stood to benefit if Curry had another weapon at his disposal. “We’d be all for [the four-pointer] as a team and an organization,” he joked.